Railpictures.ca - A.W.Mooney Photo: Perhaps someone can enlighten me as to when this particular container train ran. I believe it was a #154 that went Stateside from Mac, as shown here in its very early days. Obviously not long after start up; I doubt it ever ran much shorter than this. CN 2528 and 2552 are power this day on their way to the USA via the Grimsby Sub. These MLWs of the 2500 series were renumbered into 3500s by 1987, except a handful that were retired beforehand. The 2552 was retired in 1984, The other, as 3528, went to National Railway Equipment by 1998. | Railpictures.ca – Canadian Railway Photography – photographie ferroviaire Canadienne. Caption: Perhaps someone can enlighten me as to when this particular container train ran. I believe it was a #154 that went Stateside from Mac, as shown here in its very early days. Obviously not long after start up; I doubt it ever ran much shorter than this. CN 2528 and 2552 are power this day on their way to the USA via the Grimsby Sub. These MLWs of the 2500 series were renumbered into 3500s by 1987, except a handful that were retired beforehand. The 2552 was retired in 1984, The other, as 3528, went to National Railway Equipment by 1998. Fabulous illustration of non ‘well car’ intermodal traffic; three cars, three car configurations! CN 251/252 were ” the Hamilton connections” for overnight trains 250/253 between Toronto & Montreal. Besides COFC and TOFC they carried finished steel for Dofasco in leased containers and on leased flats ( ?DCFX ). Likely this is 251 returning from Mimico with a slow day’s accumulation of incoming…. I think this is a version of that Montreal to Hamilton Intermodal train that run around this era, not a US bound Train. Looking at the TOFC and COFC cars in here….looks identical to what came in and out of Hamilton. Also – judging by the shadows, it is a morning shot. I would have guessed this was Hamilton traffic from somewhere in the GTA (Mimico? BIT? Malport?). The 154 that ran in the early 2000′s only ran for a couple of years. 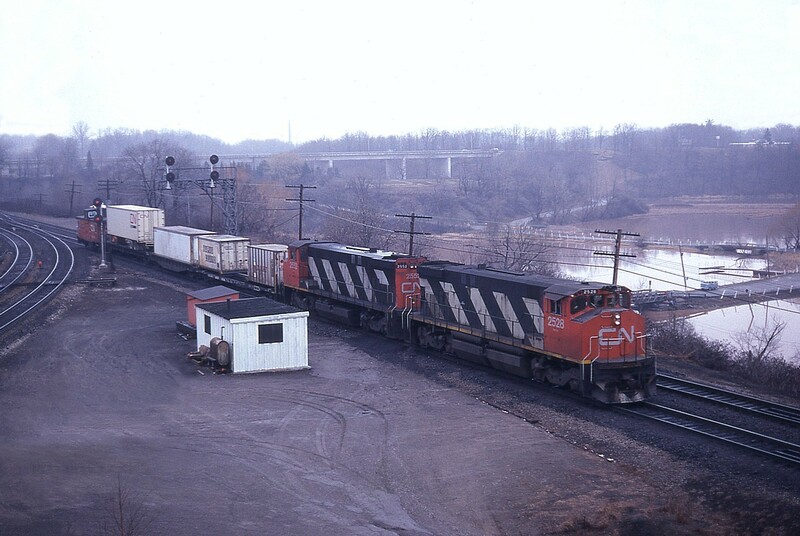 Before that on the Grimsby Sub in the 90′s were the stack trains in the 250-series that ran to CR at Buffalo. 154 was a thing when I started taking photos in the early 2000′s.. it was gone by 2005 or so..
Well how the container trains have grown! Was there other stops or was this it was all the way to the States? Great investment anyway! Hey AW..I was not working for CN when the pic was shot. I am not sure the number. We did have a train numbered 154 that ran from Mac with a stop at BIT to pick up containers then the train headed to the US. To Frontier I think.